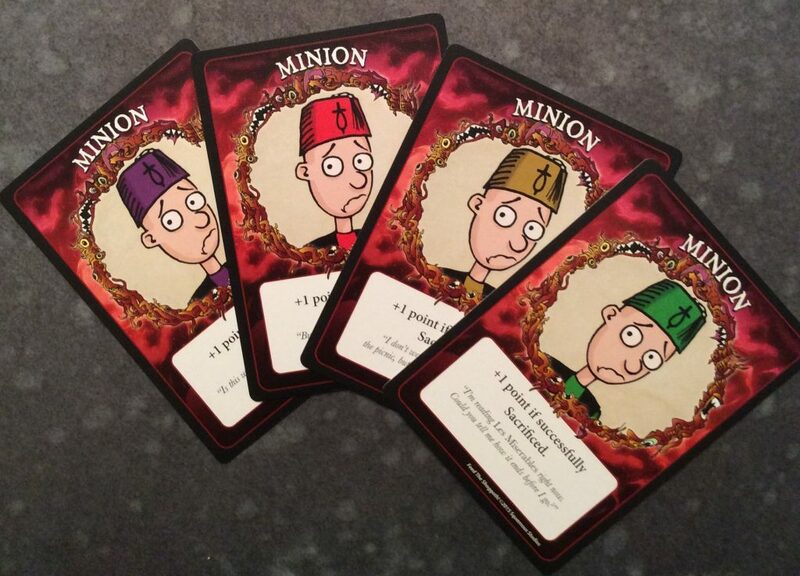 Munchkin fans rejoice! You have a new game to play to cause panic, horror, and consternation for your friends and fellow evil cultists. The Shoggoth has risen – He’s hungry and He doesn’t care who he eats. Feed him your minions or your opponents, just don’t let yourself become Shoggoth food. So…as you might can tell, this is a silly game, but that doesn’t make it less fun. 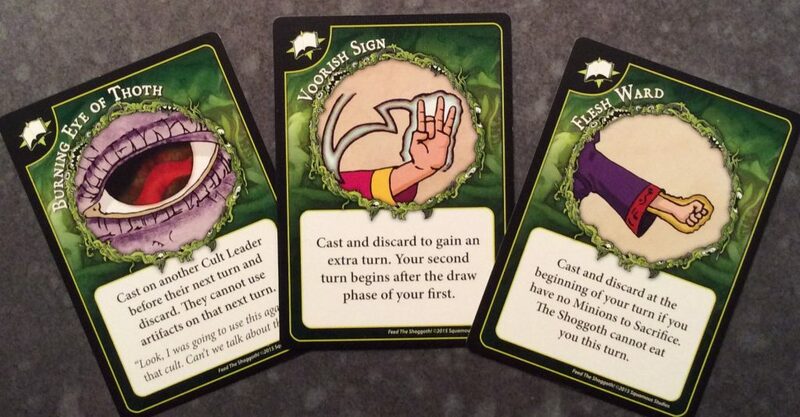 Feed the Shoggoth plays 3-6 players and takes anywhere from about 30 minutes to the End of Time (just like Munchkin). and that’s good, because you have summoned him to this world and want to feed him as many Minions as you can. Apparently you are part of some sort of Deathwish Cult with people just signing up to be eaten by a slobbering otherworldly beast. So, He moves around the table, and when He is in front of you, you must feed him a Minion or He will eat you (all humans taste the same to the Shoggoth). 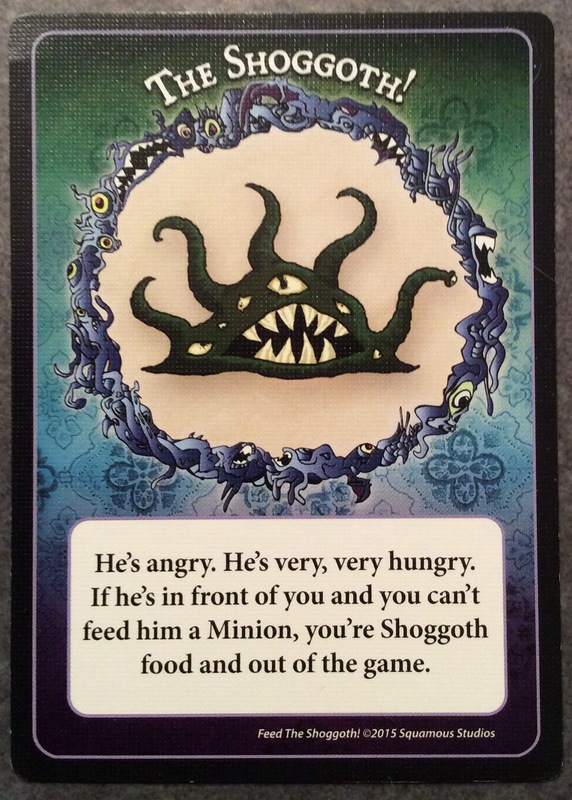 When you successfully feed a Minion to the Shoggoth, you gain a victory point. Once you feed the appropriate number of Minions to the Shoggoth and gain enough victory points, you win. See, your opponents are also trying to feed their Minions to the Shoggoth and achieve true horrific greatness, so they are trying to prevent you from accomplishing your goal. Everybody will start with a hand of 7 cards. These cards will contain at least 1 Minion (if not, you discard those cards and draw another hand until it does). These cards will consist of Minion cards, Artifact cards, Spell cards, and Action cards. You play each of these cards in different ways, but essentially you are trying to sacrifice your Minions to the Shoggoth while preventing your opponents from doing the same thing. Minion cards are pretty straightforward. You use Minions when you are in the Sacrificing stage. 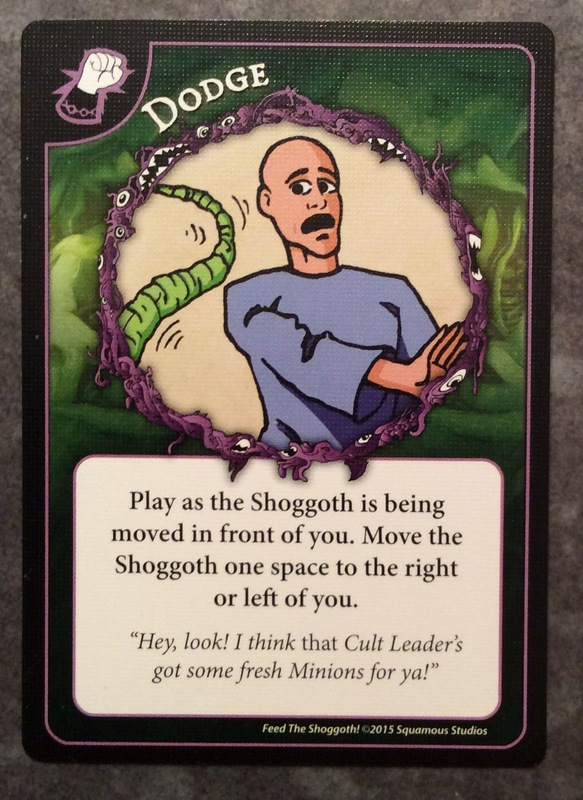 If no one stops you or moves the Shoggoth, you successfully feed Him your Minion and gain a victory point. Artifacts must be played in front of you sideways on the table, and then you must wait an entire round before being able to activate its ability. Spells can be played at any time and are usually the cards that will interrupt a Shoggoth feeding. Spells can be used to counter other spells. Actions are played like spells, but cannot be countered. So, here’s how a turn might go: It’s my turn, so I want to feed a Minion to the Shoggoth. I use a Spell card to move the Shoggoth in front of me. I also play two artifact cards in front of me, which will be able to be used anytime after the beginning of my next turn. I now announce that I will be feeding the Shoggoth. Jamie doesn’t like this idea, so she plays a spell card to move the Shoggoth in front of Bob instead. Bob doesn’t like this very much since he has no Minions in his hand, so he plays a Spell card to move it in front of Jamie so that he won’t be devoured himself. I then decide to play another Spell card myself – moving the Shoggoth back in front of me – and then I feed it my Minion. After a successful sacrifice, the Shoggoth moves clockwise to be in front of the next player (the Shoggoth is always hungry), and play continues. When one players scores the right amount of victory points – they win. So that’s the basics. It really is a lot like Munchkin, in that there are tons of “take that” actions for you to use to mess with your opponents. Each card does something different, so you are constantly referring to the Spell, Artifact, or Action card as you play it, reading it aloud and performing the action stated on the card. There is also flavor text on the cards, which adds to the humor of the game. Lastly, there are Cult faction cards. Each player takes one at the beginning of the game, which gives them a special skill or win condition. So…is it worth picking up? Here’s the thing. I don’t enjoy playing Munchkin that often for a couple of reasons. 1) Too much “take that” starts to get on my nerves and 2) Munchkin can take a really long time to play. Feed the Shoggoth feels an awful lot like Munchkin, but plays in about a third of the time. In a 4 or 5 player game, you only have to get 4 VPs to win. 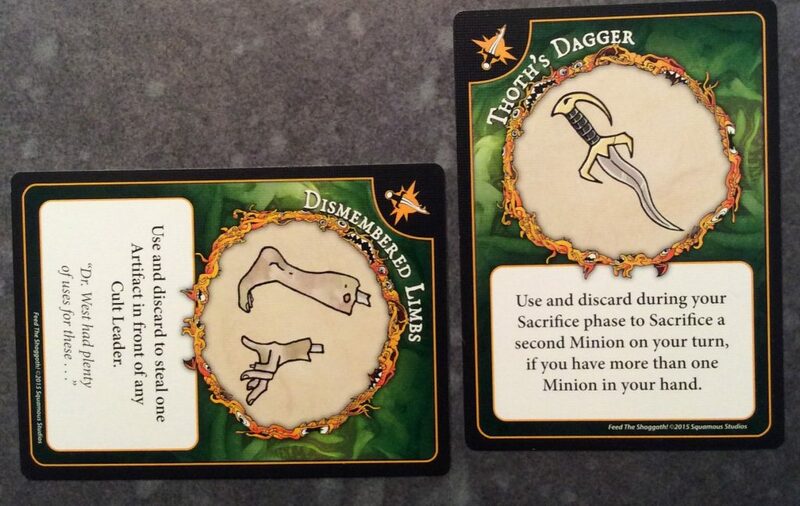 There are also cards which allow you to score 2 VPs when you sacrifice a Minion. 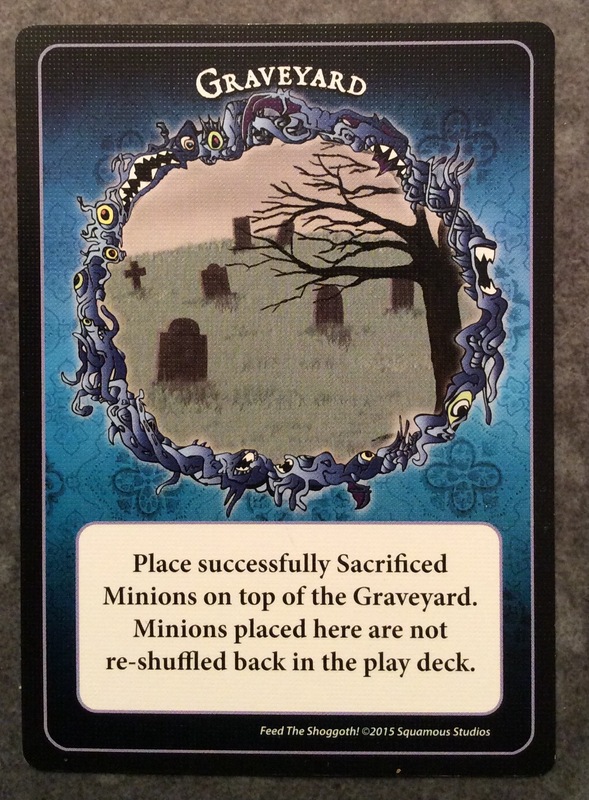 And, when you successfully sacrifice a Minion, it is removed from the game by being sent to the graveyard (only certain cards can bring them back from there). This means that eventually there will be a shortage of Minions to feed the Shoggoth, which will force the Shoggoth to eat Cultists instead. The “take that” part of the game doesn’t go away. It’s THE point of the game. As long as the game doesn’t take forever, I’m fine with it. Only one time when we were playing did the game last way too long. The game is pretty well-balanced, but that one time it went on too long, we considered not reshuffling the discarded cards to make a new draw deck. That way we could force the ending of the game pretty quickly. But…I did enjoy it. It was a nice change from most “take that” games, because you have to find the balance of trying to bring the Shoggoth to you when you have a Minion, and keeping it away when you don’t, while not revealing this to your opponents. It felt like a combination of Munchkin and Exploding Kittens. I really think that gamers who like Munchkin will love this game. And it really doesn’t matter to them whether they need another game like this since Munchkin fans tend to buy forty-five million versions of the game anyway. Even if they already have the Cthulhu version, they will want this one. The game is easy to teach and plays up to 6 players, so there will be ample opportunities to play it with all sorts of crowds. It’s a small package that travels well and doesn’t take much time to set up. It is very funny, and the artwork is fun and silly with obvious nods to John Kovalic on the Minion cards. I should say that it doesn’t play exactly like Munchkin. I don’t want to give the impression that this is not its own game or that it’s just a clone. I certainly don’t think that. There is no kicking in the door to find a monster to defeat. 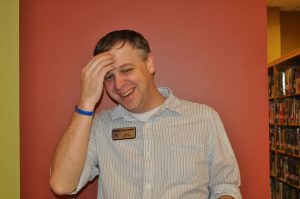 But there is the opportunity every turn for my opponents to screw me up. 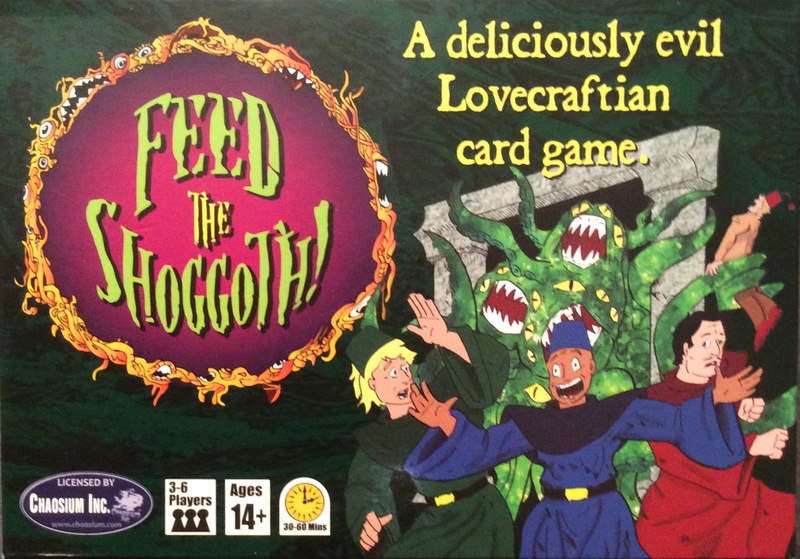 Feed the Shoggoth is much simpler, but the comparisons are immediate in the feel and in the “take that” gameplay. And I think that will appeal to a lot of gamers.